During our last freezer cooking session, my husband concocted these healthier hamburgers. 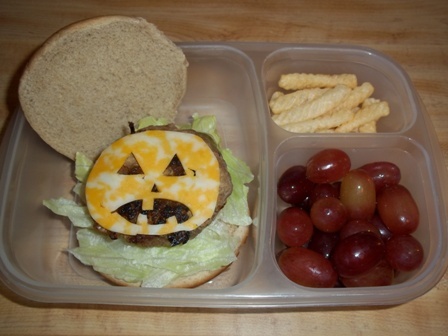 We froze 10 patties, and my son even took one in his lunch right before Halloween. I thought my husband was crazy when he put shredded carrots in these, but to my surprise, you can’t even taste the carrot. Just one more sly way to get veggies in the kids. Combine all in a bowl and mix well. Form into 8 to 10 patties. We cook these on our George Foreman grill for 5 minutes on the first side and 3 to 4 minutes on the other side, until juices run clear. Top with cheese if desired. To freeze, stack patties, uncooked, with parchment or wax paper between each. In like the idea of incoorporating grated vegies into the hamburgars. I made these last night for dinner and they were fabulous!!! All my picky eaters loved them! So glad to hear it! They are a favorite around here too.